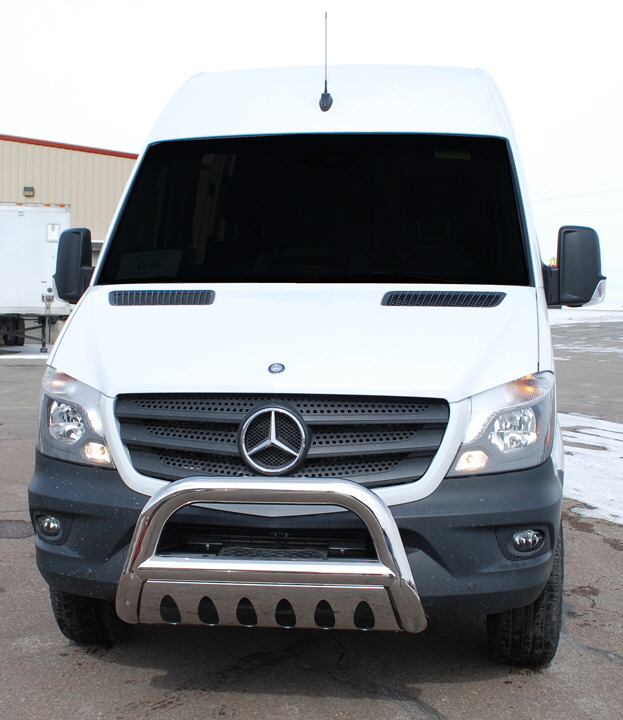 Stainless Bull Bar for 2014 - 2018 Sprinter **works with orignal factory bumper only *Free Shipping! From the cattle rancher on the open range to the industrial man of the asphalt jungle to the jerky-jawing trail hog of the north woods, the ARIES 3" bull bar is made for those who face the uncertain road without fear. It features a vehicle-specific design for a custom fit, a pre-drilled crossbar for mounting LED lights and a durable construction to complement the look of your truck or SUV. This model is made with 304 stainless steel for maximum rust resistance and has a polished finish for a bright, clean accent. **please note bull bar will work with original factory bumper only. If your bumper is painted, please check with us first before ordering. Some RV conversions have aftermarket front bumpers that will not work with this product.